Dave Lane takes a close look at spodding. How does he spod, what kit does he use and when does he spod? THERE is little point in searching out tiny little features at range if it is impossible to bait them accurately. The further that you fish the more ineffective most baiting methods become. 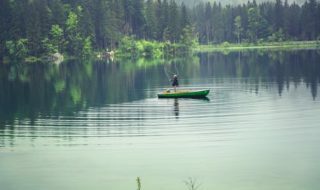 Throwing sticks and catapults are okay up to a certain range, but extreme ranges need extreme measures and if you want to fish over a tight bed of bait at distances of 100 yards plus, or if you wish to use particles or small boilies to bait up with, then you will need to use a spod. I struggled with spodding for years and, until fairly recently, I could not spod accurately over about 80 yards. Nowadays I can put a spod at the same range that I can cast a lead, and sometimes a bit further. I spill no bait on the way and I can drop my spod on the same spot every time. I don’t mean this to sound like a boast – it is just a testament to using the correct tackle for the job in hand and a lot of practice. Most custom-made spod rods tend to be around 5.5lb test curve. This is fine for very large spods, but nowadays the most popular size of spod (and, to my mind, the most manageable) is about seven inches long and, when loaded, will weigh around 5oz or 6oz. As is the case when casting a hook bait out, casting a spod is all about the correct rod compression, the balance of casting weight against blank strength and the timing. The optimum rod for spodding for a standard 6oz loaded spod seems to me to be around 4 to 4.5lb test curve. The action of your spod rod is very important too, as you need to build up compression quite slowly on the cast. This will provide the raw power needed to launch the spod. You also need tip speed at the last minute, with a fast recovery to stop the rod bouncing around all over the place after the spod has been propelled into the air. Dave rates Korda’s spod because it has a long cord attachment, allowing easy bait deployment, and large holes allowing easy retrieve. 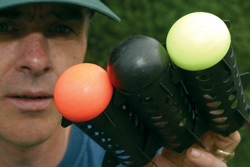 This is Dave’s choice of spod for accurate baiting at close and medium ranges. The Fox spod flies straight and deposits bait well. Finally, Dave also rates the Gardner Pocket Rockets. They fly like darts and can be used up to 100 yards range. A lot of people seem to use braid for spodding but I tend towards mono. 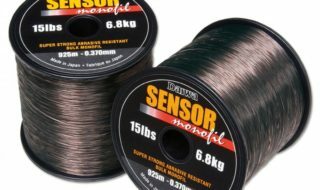 Continuous casting with braid can cause the odd tangle – a fact that can be really frustrating just when you’ve got in the groove of dropping your spod precisely on a mark 120 yards out! Obviously, a leader of some sort will be required if you’re going to use an 8lb main line, too. The spodding set-up that I now use comprises the 12 foot JRC spod rod I’ve just mentioned together with a Shimano Ultegra 10000 reel, loaded with 8lb line and a tapered ESP shockleader. The introduction of tapered leaders to the carp market has contributed massively to easing the task of distance casting. They reduce ‘crack-offs’ and tangles due to the neatness of the leader knots that can now be tied by using them. The leaders that I use are tapered from 45lb at the spod down to 15lb where they join the main line. This means that your 8lb main line will be joined to 15lb mono, which is far neater than trying to join it to a big, thick leader of over 25lb breaking strain or more. As a matter of personal choice I remove one rod length of shockleader from the thick end before use. Leaders are intended to cover many uses, including massive distance casting with big leads and for spodding you do not need this last, extra-thick section of line. Dave Lane, the man with the different coloured tops. Far easier than tying your spod directly onto the main line is to use some form of easy-release clip. This will allow you to change spods with ease. It also makes it easier to store the rod made up in your quiver if the spod is removed, as they are a bit bulky to fit inside a rod bag or sleeve. There are a multitude of different spods available nowadays and each one will perform a slightly different task. Some are ideal for small particles at close range, while others are perfect for dropping 20mm boilies at extreme range. Getting the right spod for the job is really just a matter of examining exactly what it is that you are trying to achieve, although there are some spod designs that seem to cast infinitely better than others. Casting, though, is not the only consideration. How the spod performs on the retrieve is something you should think hard about, too. Far too many spods nowadays are so resistant to water when you wind them in that they practically need to be ‘played’ back into the bank after each cast! Of the standard sized and shaped spods, the best one I have used to date is the new Korda model. It has a few alterations from the basic format that make it a bit more user friendly. Use a big reel with a large line capacity. This will help casting distance. Dave employ’s Shimano Ultegra XT reels for spodding. Dave’s choice of spod rod is for the JRC Skyliner, which casts 6-8oz of loaded spod without any trouble. Dave uses an ESP Tapered Shockleader. This gives a neater knot join and easier casting and prevents crack-offs. To change spods quickly, Dave recommends using a link swivel like this at the end of the shockleader. Most of the hard work when spodding is done on the retrieve. The holes in the Korda spod make the retrieve easy. A long cord attaching the spod to the main line is important too. This allows bait to be deposited without fuss. So, why is the Korda spod good? Firstly, the holes on it are larger and cut in an oval shape. This helps to relieve the resistance caused by water pressure on the retrieve. Often, with some more ‘solid’ spods, it can become hard work having to bring the spod in after every cast. The extended cord length and extremely buoyant nose cone on the Korda spod also play a large part in bringing it to the surface quicker on the retrieve. Additionally, the oval holes mean than the ‘dump’ time for the load in the spod will be a lot quicker, as the flow of water through the spod is increased – a very important factor when spodding large quantities of bait, especially in a big wind. If you have to wait for ages for the load to ‘dump’ then the spod starts to drift away from the ‘drop zone’ and, in extreme circumstances, part of the load will jam up and fall out on the retrieve. While winding in the spod it pays to keep a close eye as it bounces across the surface for signs of any particles of bait flying out. It is possible, with a little practice, to see when a spod has fully emptied, by the angle that it sits at in the water. An empty spod will always sit perfectly upright showing only the nose cone, while a spod with part of the load still intact will tend to list over to one side. By using the correct colour nose cone for the conditions you’re fishing in, you can easily see when the load has been dumped, even at range. So, what baits do I spod out and which spod designs suit which baits? These are other important questions you could ask yourself. When using small particles, such as hemp in the Korda spod, I bind it together with pellets to stop any hemp escaping via the drain holes before or during the cast. For very wet or sloppy baits, I favour a more solid spod such as the Fox Bait Rocket, although the retrieve of solid spods is a lot harder than that with spods that have holes in them. When spodding boilies, it pays to examine how they will sit inside the cavity of the spod. For example, three 16mm baits will tend to jam together in a standard-sized spod – and no amount of ‘flicking’ of the rod tip will free them. By either breaking a few baits or mixing the size of boilies you can achieve a less uniform mix that has a smaller chance of jamming up within the spod. Also adding dry pellets to the baits helps ensure they fall out easily. One aspect of spodding that tends to be overlooked a lot is the elimination of ‘spod spill’. This is where, just after you cast your loaded spod out, a shower of bait from the top of the spod rains down on the water just in front of your swim! It seems that some people accept the loss of one third of the spod’s payload every cast as a fact of life. They are happy to go to all that effort just to deliver a few ounces of bait on to the target. But I hate it! Spod spill is a result of the spod turning over in flight from the original casting position of ‘open-end first’ (where the spod is hanging behind your rod prior to casting) to the flight position of ‘nose-cone first’. This happens just as the spod passes through a position about five yards from the rod tip – and the inertia of the cast usually carries the bait about 10 yards out. The bait will not fall from the spod in flight, as the air pressure that closes around the rear of the spod will actually hold the remaining contents safely in place. There is no reason to put up with this spillage. You’ll just end up losing expensive bait. In fact, the problem of spod spill can be easily remedied with a little, lightly-mixed groundbait, which you place in the entrance of the spod prior to each cast. I always keep a small bag of groundbait and a bowl in the van for occasions when I may need to spod. This saves me a whole heap of bait and wasted effort in casting. The groundbait only needs to be mixed very lightly. By this I mean almost dry, but able to just hold together with a squeeze. It doesn’t matter what type of groundbait you use, but avoid very sticky ones. Indeed, the tinned Dynamite groundbait is perfect without any treatment being made to it at all. After filling the spod to about four-fifth’s capacity, simply push a small amount of groundbait over the contents and LIGHTLY compress it down. It only has to hold the bait in position for a few seconds during the turnover of the spod during the cast, so do not ram it in place – this will only add to the ‘dump time’. Not filling the spod to absolute capacity will aid the flight as well. This is because the nose cone is the lightest part of a spod, and putting too much heavy bait at the back end will destroy the aerodynamic capability of the spod as a ‘rocket’ type projectile. If you overfill it, the back of the spod will be trying to overtake the front in flight, causing a wobble that will lose you distance on the cast. Firstly, get some card (or similar) from some packaging. Then cast your spod to the area you want to bait up. Chop off an inch long section of card. You’ll be using it to protect your light main line against the line clip on the reel. With the spod in the lake, fold the card around the main line. Light line is easily damaged in a clip: the card protects it. Place the line, inside the card, in the clip. The shock of the spod pulling the line against the clip will not have any consequences! If your spod’s nose cone shows properly in the water like this, all the bait is coming out as it should do. Job done! 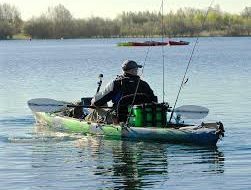 The use of a line clip, when spodding at range, is an absolute must – but care needs to be taken if you are hitting the clip with any degree of power left in the cast. Repeated casting will wear and, eventually, snap 8lb line against the clip. Try folding a small piece of paper around the line before putting it in the clip and regularly move it forward or backwards a few inches by pulling line off the clutch and reclipping. Changing the position of the clip will also help to distribute the bait a bit more around the swim, rather than piling it all up on top of itself. Once a spod rod is set up and clipped in position it can be used at any time of the day or night – it’s just as easy to add bait to the swim in darkness as it is in the daylight. As long as it lands in line with a far bank marker and hits the clip it should be in the same place every time. This way you can ‘top up’ your swim after a fish, even in the middle of the night. For close-in work of under 50 yards there are many small ‘pocket rocket’ designs of spod which will create a lot less disturbance when they hit the water and therefore do less damage to your swim by spooking fish. It’s possible with a small pocket rocket to feather it down in flight to such a degree that you can actually stop it in the air and lower it down gently onto your chosen spot. This obviously comes in very handy if you are topping up an area where fish are already present. During one winter when I was fishing at Linch Hill, I regularly used this approach with mini-spods full of maggots and light pellets to stimulate the fish into feeding. Usually the fish in Linch Hill would be scared of a big spod crashing into the water above their heads, especially as they spend a lot of the time in the upper layers of the water. By dropping a light spod of maggots silently on top of them I was able to draw them down to the area where my hook baits were without spooking them. I had a fair proportion of my fish from Linch within a short space of time after spodding in this manner, so the method obviously worked! I’d also use the small spods as bait droppers for accurately placing loose feed into holes in the weed at very close range, by swinging them underarm and practically placing the spod in position. The accuracy you get when baiting like this is almost impossible to achieve with a catapult. Spods are inexpensive items of kit: yet, when used properly, they can be a brilliant carp-catching aid. I hope the tips and ideas I have given will help you understand the technical side of spodding. With any luck you’ll become a better angler as a result.